Big News for World Migratory Bird Day! 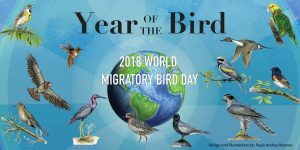 World Migratory Bird Day (WMBD) in the Year of the Bird is May 12, 2018—a day to celebrate the amazing annual migrations of the birds who know no borders. The day is also for raising awareness of conservation challenges that these world travelers face and what we can do to help. This WMBD (formerly known as International Migratory Bird Day) is a special one for Klamath Bird Observatory. We are part of a group being recognized for its collaborative achievements in migratory bird conservation. KBO will also be part of two local WMBD celebrations—Rogue Valley Bird Day in Ashland and the WMBD Birdwatching Field Trip at Shasta Valley Wildlife Area near Montague, California. It has just been announced that the Western Hummingbird Partnership has been given the U.S. Forest Service’s 2018 Wings Across the Americas award. This is a prestigious award that recognizes outstanding achievements in the conservation of migratory birds—to be presented at a special World Migratory Bird Day ceremony in Washington, D.C. this Tuesday May 1st. KBO’s Executive Director Dr. John Alexander will join other members of the Western Hummingbird Partnership Advisory Group in receiving the award. KBO will join many local partners for the City of Ashland Department of Parks and Recreation’s Rogue Valley Bird Day Saturday May 12th at North Mountain Park from 8 am to 1200 pm. KBO biologists will demonstrate mist netting and banding songbirds as a part of the festivities. We will also join A World Migratory Bird Day Birdwatching Field Trip at Shasta Valley Wildlife Area starting at 7:30 am. This event is sponsored by Klamath National Forest. CLICK HERE to view the Rogue Valley Bird Day 2018 flyer. CLICK HERE to view the Shasta Valley Birdwatching Field Trip 2018 flyer. Join us for World Migratory Bird Day! The Western Hummingbird Partnership addresses a critical need in hummingbird conservation—engaging researchers, educators, and governmental and non-governmental groups in collaborative science and education. Key partners include Klamath Bird Observatory, Environment for the Americas, Point Blue Conservation Science, University of Guadalajara, and U.S. Forest Service. Since 2006, the Partnership has contributed to projects in biosphere reserves, botanic gardens, and national forests and has provided funding in support of projects where western hummingbirds nest, stop during their migrations, and winter.